Painting any room can feel like a major commitment. Even though paint is inexpensive the application process is time consuming....and a workout! So if you are feeling like your rooms are a little blah but you don't want to marry yourself to a specific color indefinitely there are other ways to bring some life to your rooms. Here are some examples from real projects of ours which illustrate the different ways to accomplish this. 1. Art. Art is a really wonderful, stylish way to add color to a room. Choosing a larger piece of art really gives you more of an impact. 2. Furniture and Rugs. A bold sofa, or rug, layered into a neutral room can make a world of difference. 3. Accessories. The most non-committal way to add color is through accessories. A quick trip to Home Goods or Target and you have reinvented your space. 4. Plants. We love plants! Nothing really replaces the fresh look that a green plant provides. 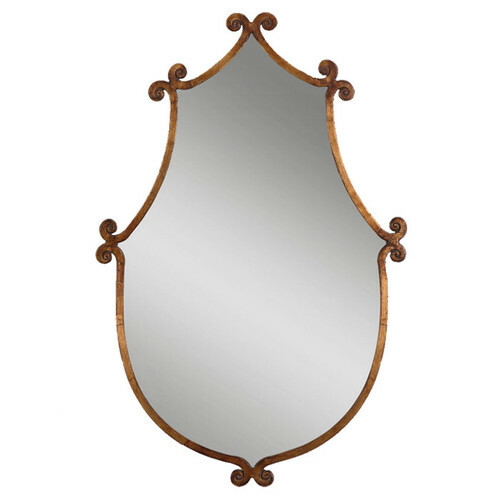 Lately I have been feeling like the mirror in the dining room is a little blah. So the search for a new, way more stylish replacement ensued. Wow are there a lot of stunning mirrors out there right now. Here are a few of my faves from my shopping adventures. The first is this stunner from Uttermost. At $169.40 on Wayfair.com it is steal. I really love the unusual shape and detail. This would be great in any room and would make an excellent choice for a bathroom in lieu of a cabinet or more traditional mirror. 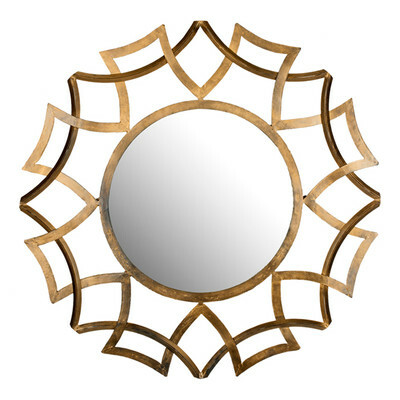 Another great option is this take on a sunburst style mirror from Safavieh. It would look great above a sofa or buffet table and or in an entry. This one is $185 from Wayfair.com. So which one did we pick? We haven't yet. It is a toss up between the first two. I really love the idea of mixing a more traditional mirror with the dining room but at the same time, I am drawn to the starburst one. Dilemma. The good news is that a nice mirror is really versatile so it can always be moved to another room when it is time to change things up a bit. We are always amazed at how much of a change swapping one detail of a plan out can make. So we decided to put it on paper and show you what we mean. We took one look that we presented to a client and swapped out the sofa four times. See the difference just a new sofa can make. This was our original look. We love the white sofa paired with neutrals and kicked up with art and accessories. This was our second visit to this look. We are currently on a navy blue kick so we were excited to see that the navy really looked great with this look. This is another great version of the same look. The warm grey sofa really makes this look feel rich but cozy and approachable. We love this look! It has such a Miami feel to it. This aqua sofa is gorgeous! And last, but not least, a gorgeous dark grey sofa. This look is great too...the grey will really pop against the light rug and the oatmeal chairs. Usually by the time someone calls us for help with a design project they are ready to pull their hair out. Believe me, I understand the overwhelm they are feeling. I feel the same way when I shop for clothes. I can shop for hours and come back with nothing. It seems my clients make the same kind of progress shopping for their homes. So how do we tackle this sense of being totally overwhelmed? The first thing we do is work on decorating rooms one at a time. I actually will not take on clients who will not agree to work on one room at a time. Why you ask? Well, when you handle things piecemeal it is harder to see progress. A new sofa here, a new pillow there, but all the while all five rooms you are redoing at once are still mostly not done. Then there is the confusion problem....does this pillow go with the living room or Sue's room? Was I looking for curtains for my room or the dining room? It is too much to keep track of. One room at a time keeps you focused with your eye on one ball. Everyone knows what is going on and what the goal is. Progress happens faster and the end result is lots of renewed motivation and excitement. Then the one rooms is done and we move on to the next. It keeps it fun and fresh. I love books.... I wish I had a chance to read more than I do. I have, what seems like an endless list of books I want to read. I also love to decorate with books. Last night, I was visiting with a girlfriend at her home for the first time and I was struck with total envy - a room where every wall was a bookshelf. Hopefully, someday, I too will have a room like this. Until then, I can just drool over hers. Do you have a lot of books? Wondering where to put them all? Here are some great ideas! Clutter is a mystery to me. At the end of the day it is really just "stuff". So why does it have this magical power over us? Why do we, as a society, seem to be ineffectual in our attempts to control it? I wish I had these answers because it would really help my clients who are preparing their homes for sale. What we do know about clutter is that, universally, it makes us unhappy. Nobody is happy with a home filled with clutter. We also know that our clients, time and again, tell us they cannot believe how much better their homes look after they have cleaned, purged, and reorganized. We also know that the process has a snowball effect....the more you purge and organize the more motivated you are to keep going. We recently stumbled upon a "Clutter-Busting Challenge" that we are fully prepared to participate in and would love to encourage you to do so as well. The challenge runs through the month of May and is being run by one of our favorite bloggers Crystal Paine of Money Saving Mom. The challenge is simple - get rid of seven things every day during the month of May. Crystal doesn't specify that you have to throw them out, so get creative. We plan to sell stuff on EBay, donate, take items to the consignment shop, give things to friends and family....whatever it takes. We would love for you to join us on this adventure. Check out the information on the challenge here and get ready to spend the month with us. Here is our end goal!! So if I had once pet peeve as a designer, it would be window valances. Truthfully, I am not sure if I actually hate the draperies themselves or rather the fact that they must be the most commonly misused window treatment in existence. I have never seen a valance in a home used properly. Most often they are hung too low, block the room's light, and make the ceiling feel shorter. All these things add up to a room just not feeling right. Every time we have instructed a homeowner to remove their valances prior to listing their home for sale the feedback afterwards has been surprise at how much brighter the room is. I hope that the following images will make you understand why they make us so unhappy.